John W. Clark (CRD#: 4650371, Abilene, Texas) formerly worked at Merrill Lynch. He was reportedly a general securities representative in the firm’s Abilene, Texas office from May 5, 2003 to February 4, 2019. John Clark reported on his FINRA BrokerCheck profile that on May 26, 2017, a Merrill Lynch customer filed a complaint alleging John Clark made misrepresentations. Specifically, the customer claimed that John Clark made false or misleading statements about variable annuity terms and features. Apparently, the customer purchased the annuity at the time John Clark allegedly made those misrepresentations. As a result, Merrill Lynch opted to settle the customer’s claim on July 20, 2017 by paying the customer $15,000.00. Charles Dale Watson (CRD#: 4063528, Germantown, Tennessee) is a past Merrill Lynch general securities representative. Apparently, a customer of Merrill Lynch opposed Charles Watson’s sales practices by Filing FINRA Arbitration #17-01546 on June 13, 2017. First, the customer claimed that Charles Watson made bad investment recommendations to the customer about options investments. Second, the customer contended that Charles Watson omitted important investment information concerning those options investments. Allegedly, Charles Watson’s omissions and unsuitable recommendations happened between August 2012 and June 2017. Despite the broker denying the customer’s allegations, Merrill Lynch chose to settle the claim. Accordingly, on May 7, 2018, the firm acquiesced to paying the customer $175,000.00 in compensation. Subsequently, on January 14, 2019, Merrill Lynch disaffiliated with Charles Watson. He is now a Raymond James & Associates, Inc. registered representative. Akinwale Adebayo (CRD#: 5198788, New York, New York) is a Merrill Lynch general securities representative. Apparently, Akinwale Adebayo started working in the firm’s New York, New York offices on April 7, 2016. The FINRA BrokerCheck Report on Akinwale Adebayo shows that at least one customer filed a dispute about him Specifically, on July 5, 2017, the customer brought a lawsuit #100739/17 in the Supreme Court of the State of New York. Allegedly, Akinwale Adebayo inappropriately solicited investment transactions from the customer. Also, he allegedly engaged in private securities transactions. Particularly, the claim alleges that Akinwale Adebayo sold away from Merrill Lynch. As a result, the firm apparently did not oversee the nature of Akinwale Adebayo’s transactions. Therefore, the customer has made a request for $111,658.00 as redress for the harm Akinwale Adebayo caused. However, Akinwale Adebayo denies the customer’s allegations, claiming he was not involved in the transactions. Accordingly, this matter is pending a resolution. Glenn Michael Patti (CRD#: 2218714, New York, New York) is presently a general securities representative of Merrill Lynch. One of Glenn Patti’s customers filed a dispute about his sales practices. Apparently, on February 9, 2018, the Merrill Lynch customer filed a complaint about Glenn Patti’s failure to follow instructions. Allegedly, Glenn Patti failed to listen to the customer’s requests in February 2018 relating to mutual fund investments. All things considered, Merrill Lynch and the customer agreed for the firm to pay the customer $26,576.68 for the alleged harm. Accordingly, Merrill Lynch settled the matter on May 18, 2018. 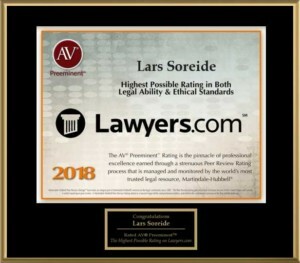 Investors who have incurred losses from Merrill Lynch brokers John Clark, Charles Watson, Akinwale Adebayo or Glenn Patti are encouraged to contact Soreide Law Group at (888) 760-6552 for a free consultation. Our firm has recovered millions of dollars for investors who have suffered losses due to broker misconduct. We represent clients on a contingency fee basis and advance all costs.